WHAT IS THE MOST CALORIFIC PART OF YOUR CHRISTMAS DINNER? 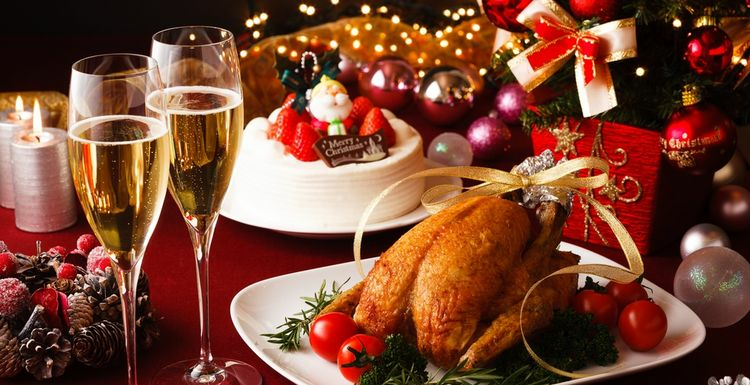 On Christmas day you could wrack up a whopping 7,000 calories - and that's not including any booze you might imbibe. For most of us, the big feast is both the most stressful and the most delightful part of Christmas day. No-one wants to be fussing about calories at Christmas, but how can we enjoy the day without wrecking the hard work of the year? The answer is to arm yourself with the true facts about Christmas nutrition. That way you can enjoy some festive tastes with upsetting your digestion or your physique. Here’s what each component will give you, and where the calories can stack up. Breast meat comes out at just over 150 calories per 100 grams when roasted, with the dark meat at about 180 calories per 100 grams. Turkey (like its cousin the chicken) is an excellent source of protein. Try to do without the skin which is very calorie dense. Each of those roast spuds can be nearly 200 calories. Eating your spuds boiled halves that figure, so fewer roasties and more boiled is the way to go. Parsnips, carrots and sprouts are the vegetable colours of Christmas, and are where you can really dive in. The carrots and sprouts clock up a miniscule 30 calories per 100 grams. Parsnip is higher in calories as it has more sugar, at about 70 for 100 grams. Surprisingly, roasting the parsnip only makes a small difference in the calories. Cranberry, bread sauce and white sauce are delicious but high in fat. Limit these and make the most of the main tastes. Stuffing, sausages in bacon and the gravy are the perennial tastes of Christmas Day, but they are really where the calories lie. Make sure they are just trimmings, not a main course. The actual Christmas lunch generally tots up to a big but not impossible 1500 calories, depending on portion sizes and combinations. It is the pudding, sweets, snacks, mince pies and the rest can make for a monster 7000(!) calorie Christmas Day. The best bet? Enjoy your lunch and get out for a walk rather than spending the afternoon nibbling. That way Christmas won’t bite back in the new year. Loads of veg is the answer. But really - just enjoy! I'm with you Claire. There is no way I'm limiting cranberry sauce, roast potatoes and trimmings. They're what make it Christmas dinner! I never ever worry about what I eat on Christmas Day. It's one day!! And isn't the benefit of exercising meant to be that you can treat yourself once in a while? As always, pile the vegetables high on your plateand you won't pile on the pounds.